LADOT has installed new painted curb extensions along Vermont Avenue in Pico-Union. The above extension is at Venice Blvd. All photos by Joe Linton/Streetsblog L.A. Earlier today Streetsblog spotted a few more painted curb extensions on Vermont Avenue in L.A.’s Pico-Union neighborhood. Thermoplastic-paint extensions are in place at the Vermont Avenue intersections with Pico, Venice, and Washington Boulevards. The one-mile stretch of Vermont from Pico to Adams Boulevard is on the list of the top 40 Vision Zero priority corridors identified in the January Vision Zero Action Plan. They are fairly similar to other Vision Zero painted extensions on Third Street and further south on Vermont Avenue. Red painted curbs and white thermoplastic striped curb extensions are a great way to obtain space for future bike lanes. Less objections when these curb extensions are in place first compared to putting in bike lanes first. Except that likely won’t happen since there is still parking. At best this infrastructure is a placeholder for curb extensions, which will actually make it more difficult to install bike lanes than the current situation. Streetsblog is giving too much credit by saying this is any kind of safety improvement. Nobody is going to be fooled into thinking that Vermont is now a safe street to bike, or walk. But both of these improvements are right next to far better bicycle corridors that are lacking funding. 3rd street is a mess for cyclists, but 4th street 1 block south already has some cycling improvements but could really do with a protected lane and some interchange enhancements. Pico is just a little north of Venice, which is wider and has a bike lane again in need of more protection and interchange enhancements. 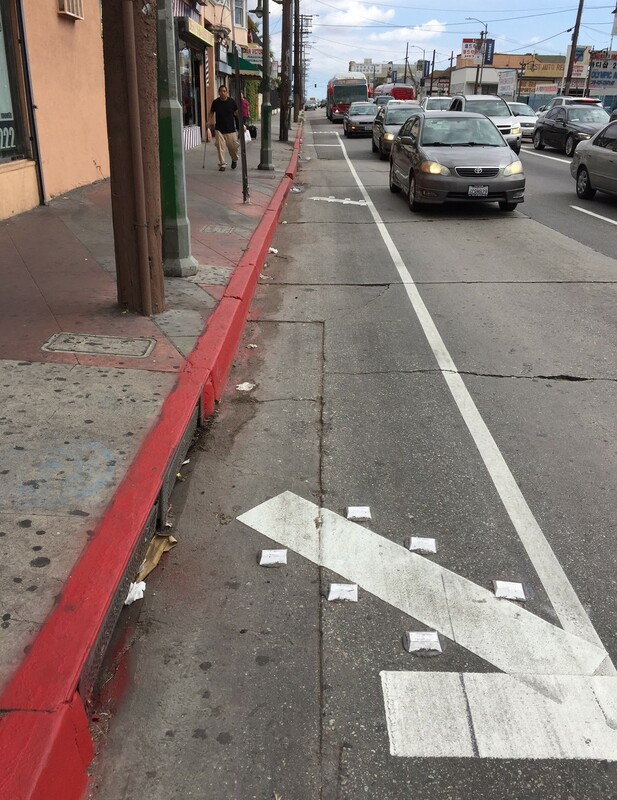 I would rather put aside money and space for a really nice network of protected bike lanes on less trafficked streets like 4th and Venice, than have painted bike lanes scattered all over the city. Investment needs to be focused into a use-able network. Vermont isn’t even a safe street to drive. I suspect there arent too many fatalities on the bus, but that is painfully slow. It fails every mode. 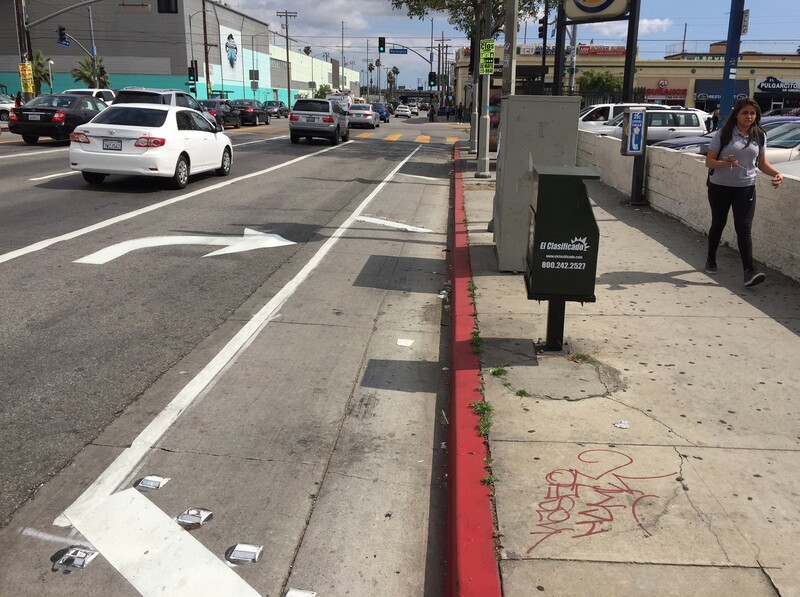 As part of the city's Vision Programs, LADOT added painted curb extensions to Third Street between Vermont and Normandie Avenues. 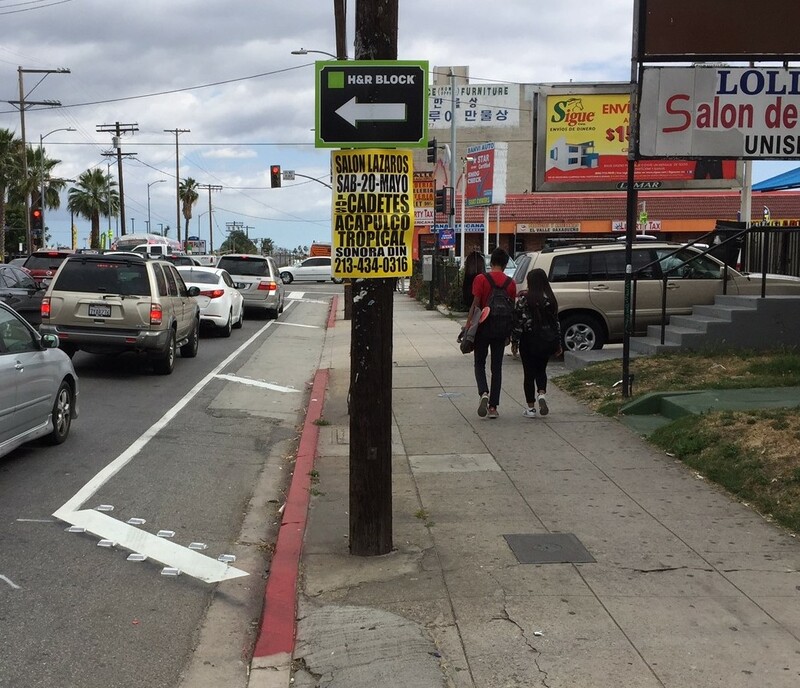 Vision Zero Aims to Improve Safety along Main, Broadway, Western, Hoover, and More in South L.A. The focus on South L.A. is due to the high rate at which pedestrians and cyclists are killed or severely injured (KSI) in collisions with vehicles. 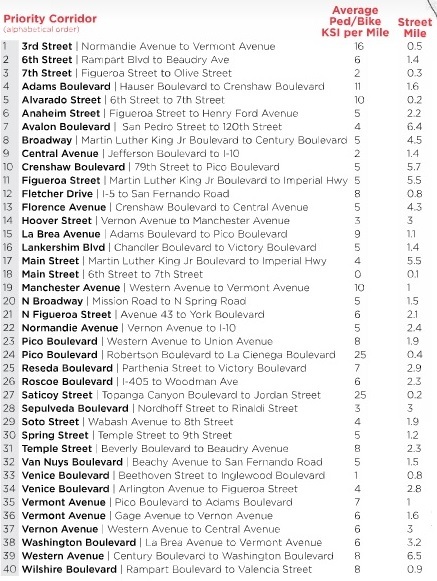 Case in point - sixteen of the twenty-five most dangerous neighborhoods for cyclists and pedestrians called out on the map below are in South L.A.